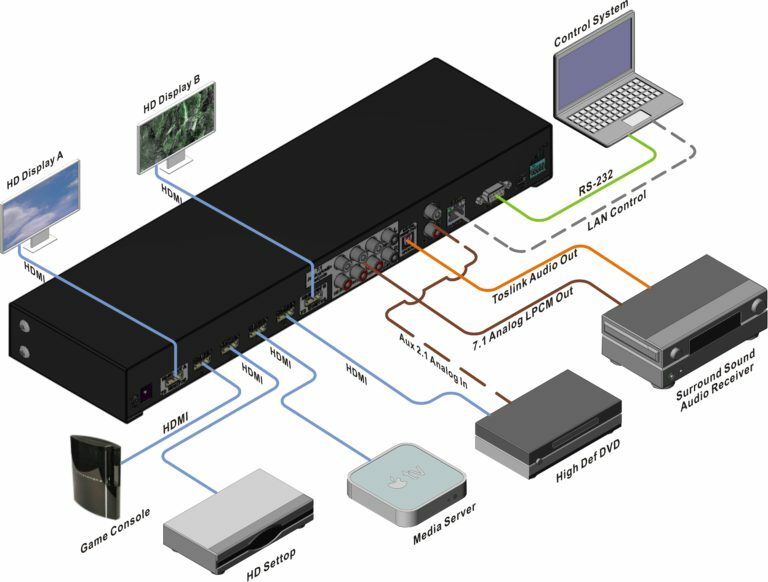 Octava HDMI Matrix Switch. 4 Video In and 2 Outputs with Audio Ports for Sounds System Integration. The Optical audio output supports both PCM and Bitstream audio formats. LPCM audio is supported thru the RCA analog audio outputs(x8). Perfect for systems with LPCM support such as PS3 . An Auxiliary ( 2ch) audio Loop thru port is included to connect to a second Analog (8ch) source. USB service port for EDID customization. EDID Library availaible on support web site for easy customization.